Who Was Barbara Burnett Smith? Barbara Burnett Smith died in an accident in San Antonio Saturday night. Barbara and her husband were there to rescue a dog, and when they visited Remember the Alibi (bookstore), the dog ran from their car and into the street. It was raining and dark, and apparently Barbara stepped into the street to catch the dog. She was hit by a car and died in the hospital. I’m still in shock over this. I’ve known Barbara for at least 15 years, and she was one of the nicest people you’d ever hope to meet. She was lovely and perky and a very talented writer. She was also the former daughter-in-law of another fine mystery writer, Thomas B. Dewey, whom she credited with helping her quite a bit when she was starting out. Bill’s comments about Barbara Burnett Smith are similar to everything I’ve heard about her. She was well-known and well-loved in the writing community. Barbara was a member of several writing groups and served as the president of Sisters in Crime (International 1999-2000). 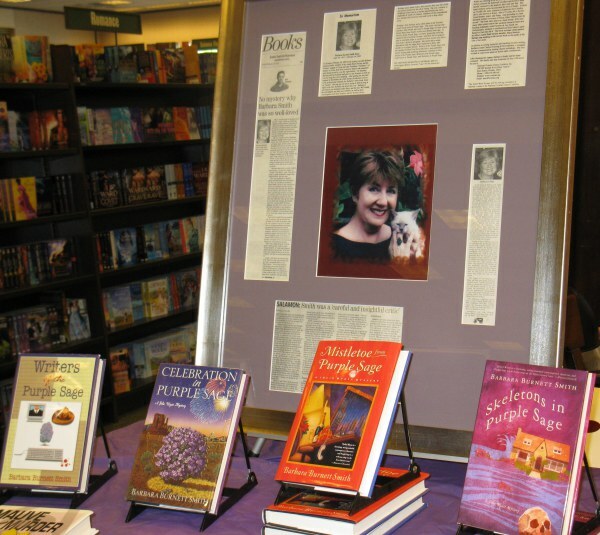 She was a writer of cozy mysteries, including the popular Purple Sage series featuring heroine Jolie Wyatt, an amateur sleuth and radio newscaster in a small Texas town. Shortly before her death, she began a new mystery series with Bead on Trouble, whose main character, Kitzi Camden, was an amateur sleuth and beader. Her second book in the series, Beads of Doubt, was completed by fellow Sisters in Crime member Karen MacInerney. She always had the drive to be at her best and asked that those around her did the same. After she started writing and got out of the corporate world and took on the training game, she started to change. She wanted to give back to people and hope they had a better time of it than she did, trying to succeed in a man’s world. After a few years in the training game and running a successful business (or at least one that paid the bills), she really started to shine. She saw people for who they were and wanted to help in any way possible. I don’t think she ever watched Oprah but I believe she garnered sound bites from her show. She used a quote from Maya Angelou: “People will not remember what you said to them, but they will remember how you treated them. On March 13, 2005, A Celebration of Barbara Burnett Smith was hosted by the Heart of Texas Sisters in Crime chapter. The Barbara Burnett Smith Mentoring Authors Foundation was established in her honor to support and provide a mentoring community to help budding writers. We are now approaching the tenth annual BBS Aspiring Writers project, to be held during May Mystery Month at Recycled Reads, on May 18, 2014, at 2 p.m.
As BBS project coordinator, I’m calling for submissions of the first 500 words of a mystery story or novel by an unpublished writer. After the submission deadline of March 31, writers will be matched with published mystery authors for mentoring. The mentors will introduce their aspiring writers at the Sisters in Crime meeting on May 18. For more information about submission rules, go to the Events/News section of this blog.